NEW Reflex Nutrition Instant Mass - Weight gainer beyond compare. - Why do we at Gym Ratz rate the NEW formula Instant Mass weight gainer by Reflex Nutrition so highly? 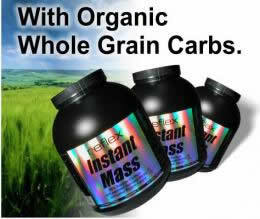 I'll tell you why; Reflex have taken a bold step in re-formulating Reflex Instant mass weight gainer by taking the Maltodextrin as was used in the previous Reflex Instant Mass formula (along with every single other weight gainer on the market) and replacing it with a combination of Activated Barley and Oats. Both of which have incredible health benefits rather than purely being just a source of Carbohydrate. Both myself (Pete) & Matt find the slightly "Oaty" taste of New Reflex Instant Mass extremely favourable and far nicer than the sweetness of maltodextrin. The only unfortunate aspect is the use of such unique ingredients has lead to a slight price increase, but we both agree the extra cost is far outweighed by the taste & health benefits. While other companies still use maltodextrin as the main source of carbohydrate for their weight gain formulas, Reflex Nutrition have taken the initiative and brought you a unique alternative. Instant Mass now contains a unique blend of patented Activated Barley from Sweden and Organic Oats from the heart of Scotland that has an extremely low glycemic index. The OFO-Method and Activated Barley. Named after the Swedish inventor Owe Forsberg, the OFO-Method is a unique patented natural treatment, (via the exact application of different levels of pressure, humidity and temperature), of organic Barley that increases the energy level of barley whilst activating nutrients and dormant enzymes. The result is Activated Barley, a totally unique, low glycemic index super food that is rich in naturally occurring enzymes, vitamins, minerals, fibre, energy and protein. Each serving of Instant Mass contains a special blend containing 50 grams of complex carbohydrates from Activated Barley and Organic Oats - almost certainly the best source of carbohydrates you will ever find in a weight gain formula. 52 Grams of Whey Protein and Micellar Casein. Reflex Instant Mass contains a revised blend of cold processed ultra filtered Whey Protein Concentrate, Whey Protein Isolate, Milk Protein Concentrate(80% micellar casein /20% whey protein) and Digezyme enzymes. For added benefit we now include Lactospore pro-biotics, similar to those found in yoghourt type drinks. If you like great tasting milkshakes then you will simply love Reflex Instant Mass formula. It is instantised for easy mixing and tastes absolutely delicious. Just take one or two servings a day. 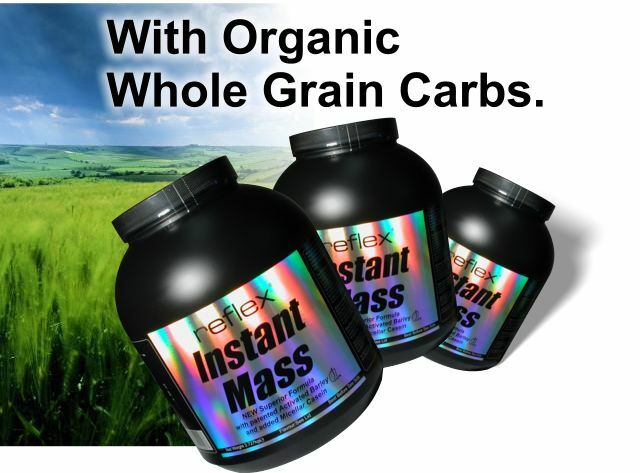 Reflex Instant Mass - Delicious and Nutritious, the best Weight Gainer on the market! Instructions for use: Take 5 measures (approx. 136gms) and mix with 400ml of water or skim milk. Or take a half serving (2.5 measures) and mix with 400ml of water or skim milk. Consume 1-2 servings daily. Or 2-4 half servings daily. Always consume one full serving after a workout. * Ingredients : Protein blend (Micro filtered whey protein concentrate & cross flow micro filtered whey protein isolate (43% �- Lactoglobulin, 18% Glycomacropeptide, 16% Lactoferrin & Others, 15% a- Lactalbumin, 5% Immunoglobulin, 3% Serum Albumin, milk protein concentrate(80%micellar casein/20% whey), Digezyme�(digestive enzyme blend, Lactospore� pro-biotics)), organic oats, Activated organic barley, cocoa powder(choc flavour only), flavourings, carboxymethyl cellulose, zinc/magnesium aspartate, zinc l-monomethionine, natural colouring, ascorbic acid, artificial sweeteners(sucralose, acelsulfame k), copper chelate, pyrodoxine hydrocholride,chromium chelate.